Adelaide Wilson (Lupita Nyong’o) returns to her beachside childhood home with her husband Gabe (Winston Duke) and their two children, Zora (Shahadi Wright Joseph) and Jason (Evan Alex), for an idyllic summer getaway. Haunted by an unexplainable and unresolved trauma from her past and compounded by a string of eerie coincidences, Adelaide feels her paranoia elevate to high-alert as she grows increasingly certain that something bad is going to happen to her family. After spending a tense day at the beach with friends, Adelaide and her family return to their vacation home. When darkness falls, the Wilsons discover the silhouette of four figures holding hands as they stand in their driveway. Click here before your doppelganger subscribes to 500 Days Of Film! With Us, the less you know the better. This makes reviewing Jordan Peele’s second film something of a challenge. However, there will be no pesky spoilers here… just a rather excitable, absolute and wholehearted recommendation. What I can tell you is that you need to go and see this film… process it, discuss its themes with others (because you are going to need to) and then go and see it again (because you are going to need to). What I can also tell you is that Us is an intelligent, precise, tense, entertaining and unsettling horror movie (and breathe). A visually stunning film (and, oh my, that score) that will haunt you for a long, long time. Or this has been my experience, at least. Working on a wider narrative and thematic canvas than Get Out (a new cinematic universe perhaps? ), Us blends satire and horror. It features numerous references to other films in the horror genre (and television shows such as The Twilight Zone) from home invasion classics to movies with a bent for the apocalyptic. However, while many comparisons can be made to other movies and other directors, Us is still very much a Jordan Peele film. Peele uses his movie to explore many troubling issues in society (and his fear of rabbits) including duplicity, the forgotten and disenfranchised, the price of generational sin and the dark and disturbing side of entitlement and privilege. There are so many thought provoking themes in Us. This really is a movie that will reward/demand repeat viewings. The intelligent, purposeful (every word, every image is there for a reason) and complex narrative in Us also features a consistent flow of (often laugh out loud) humour. It shouldn’t work, but it absolutely does - thanks to Peele's incredibly impressive writing and directing. Impressive too (and this is an understatement) are the film’s central performances. Lupita Nyong’o is simply outstanding. Hers will surely go down as one of the classic portrayals in horror cinema. Winston Duke is brilliant as Gabe - responsible for much of the film’s more comedic moments. Shahadi Wright Joseph and Evan Alex also give fantastic performances. Meanwhile, Elisabeth Moss is superb in her role as Adelaide’s friend, Kitty. It is only after you have had time to process all of the elements in Us - the endlessly thought provoking themes, the brilliant performances, the super smart writing, the impressive direction, the stunning cinematography and the incredible score - that you realise this film is a masterpiece. Go see Us… process, debate and see it again. It is one of the finest films of the year. 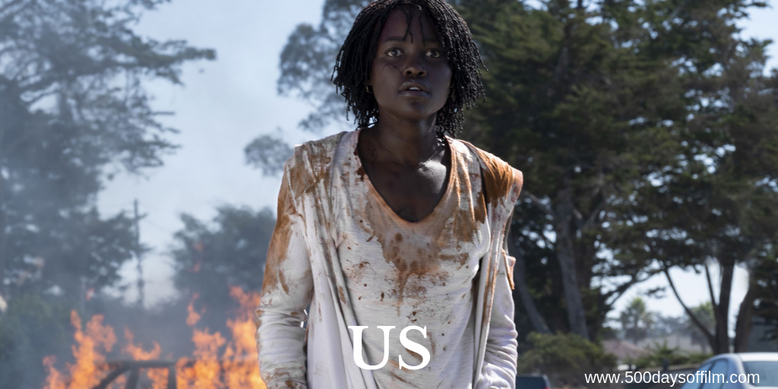 If you have, what did you think of Jordan Peele’s second film? Let me know in the comments section below or over on Twitter. You can find me @500DaysOfFilm. This is my kind of drama.